My students at 〇〇 High School tended, for the most part, to be very intelligent and eager to learn. This is not at all indicative of the JET experience (as they say, "Every Situation Is Different,") but I was fortunate enough to be in a high-level school teaching an advanced class 95% of the time. Once a month, however, in my first and second years at 〇〇 High School, I saw the academics-stream ninensei (11th graders) for a lesson. This was a tougher class for me since there were 40 students and I frequently co-taught with Japanese teachers whom I wasn't really used to working with in the classroom. Some expected different things of me than others, though thankfully none of them ever expected me to perform as a human tape recorder, a much-bemoaned ALT task. By the time I started with the ninsensei I had already gotten used to the patterns of my advanced classes and begun learning their names, so I took a similar approach with the academic classes, though it was not as successful as I'd hoped. I had trouble learning the names of more than a few students - and they stood out for the wrong reasons; mostly because I had to stand over them and lead them through the worksheets. There was one student, though, who caught my eye not because she was loud, but because she was so quiet. This student (I'll withhold her name for privacy) was an enormous fan of the Pokemon series. She carried her DS in a little purse-shaped case, day in and day out, and all her school supplies were Pokemon-related. I should note than she took no flack for this that I ever witnessed or heard about; quite a few of my students were into Pokemon games and the dividing line between what is 'childish' versus 'cool' is much more blurred in Japan than I recall from my own high school years. Well, I wasn't actively playing Pokemon at the time, though I owned one of the more recent games. Since I had played some of the other games in high school and tuned into the television show occasionally in Japan (the easy vocabulary in kids' anime made it pretty much all I could watch), however, I had something in common with this shy girl that I thought I might be able to use to help her with her confidence in English. Every time one of her essays crossed my desk (I corrected assignments for one of our student teachers at the time), I put a Pokemon sticker or stamp on her paper. Prior to winter vacation, I bought a copy of a Pokemon manga in English and loaned it to her in hopes that she'd do some reading practice with it. I struck up conversations with her about her hobby and she taught me the Japanese names of the various monsters - no matter which one I thought of, in English, she could tell me its Japanese name. Our conversations consisted of anime catchphrases and Rocket Gang motto material. No matter what I did to be friendly, though, I could never get her to speak in my class unless I called on her by name - and I know that was probably mortifying for her, so I tried not to. One day, though, she did something that I won't ever forget. After our monthly lesson, this student came to me at the end of class and asked me to bring in my DS the next day as she had a present for me. 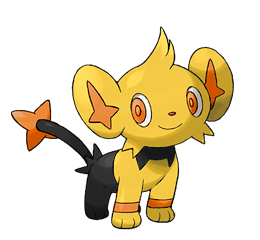 She had gotten a rare "shiny Kolink" (a Shinx, in the English version) in her Pokemon Pearl game, knew I liked them from a previous conversation, and had saved it to trade to me. According to Wikipedia, the chances of catching a shiny Pokemon are 1 in 8,192. I was so glad she thought of me, it really made my day. I brought my game and visited their classroom over lunch. Of course we had a battle, and she absolutely decimated me, even though she had deliberately chosen low-level fighters. Later, she told me that she had max-level shiny versions of almost every monster, and would much later present (I was very proud!) a speech about Pokemon and her dream to work for Game Freak, in English with hand-illustrated placards, at the school speech contest. I will never meet again meet a Pokemon Master like this one. I'm glad I found a common ground with her and was truly sad when she moved on to sannen and left my class. I hope whatever she's doing out there - she's closer to her dreams.